D.I.Y. pantry staples easy as P.I.E. — share yours? Whoa. Nice food-page cover-spread this morning in the New York Times: a “D.I.Y. Cooking Handbook” courtesy of food writer Julia Moskin. Julia’s right: it doesn’t take molecular gastronomy — nor fancy kitchen equipment — to produce the easy-to-make staples in her aptly named “starter-kit”: a kit that includes more than a dozen recipes, from cultured butter to chocolate-hazenut paste to kimchi. I know she’s right because I’ve got some of those do-it-myself staples in my kitchen. Including the creme fraiche I started making from scratch (for the first time, this year) when I was trying to figure out how to use up the extra gallon of heavy cream I had on hand post-Thanksgiving. And now, every time I see those little 8-ounce tubs of the stuff at the fussy supermarket for $6.95 I feel really smug. I use Dorie Greenspan’s ridiculously easy creme fraiche recipe from her gorgeous new book “Around My French Table”. All you need is a clean jar with a tight-fitting lid, a cup of heavy cream, a tablespoon of buttermilk or plain yogurt plus a good arm for shaking and — Voila! My breakfast. This time of year, you’ve got to love those frozen berries from Remlinger Farms, a staple in my freezer. Barbara Tropp’s Chinese chili oil has been a homemade staple in my kitchen since I first got my hands on her “China Moon Cookbook” nearly 20 years ago. Recipes for her chili oil, and for creme fraiche, are included in Julia’s “handbook” and both are indispensable in my kitchen. China Moon hot chili oil is exceedingly easy to make. The salted Chinese black beans I use are widely available at area Asian-food markets for less than $2 a bag — and did I mention that bag lasts forever? To Julia’s starter-kit I would certainly add the Vietnamese pickle I told you about last week. And mention (as I’ve done before) that recipes like these double as the perfect hostess gift. Yes this pickle, made with carrot and daikon, is a little stinky. But that’s part of the charm. And hey! People pay a lot of money for stinky food, right? Speaking of gifts, Moskin also provided readers with a terrific D.I.Y. Cooking Bibliography — a list of websites, cookbooks and other resources to help you fatten your larder. 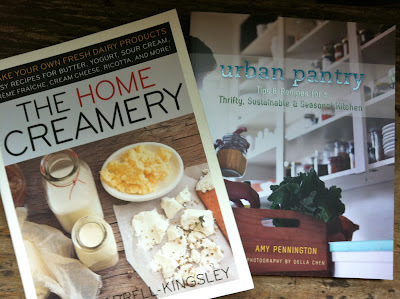 To which I’d also add Seattle’s own Amy Pennington’s “Urban Pantry: Tips & Recipes for a Thrifty, Sustainable & Seasonal Kitchen” and Kathy Farrell-Kingsley’s “The Home Creamery,” with recipes for all kinds of dairy products including butter, kefir, yogurt and ricotta. Yes you can — do-it-yerself. Now tell me: What would you add to the list of easy-to-make pantry staples? And which books, websites, blogs or other resources do you turn to for inspiration?